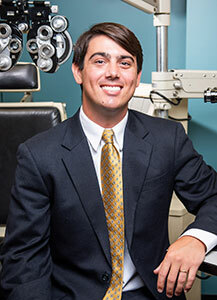 Dr. Parker specializes in cornea, cataract, external disease, refractive surgery, and minimally invasive glaucoma. Originally from Montgomery, AL, Dr. Parker graduated with honors in biomedical sciences and a minor in Spanish at Auburn University. He obtained his medical degree with honors from the University of Alabama School of Medicine. Following medical school, Dr. Parker completed an internship at Baptist Health Systems in Birmingham, AL. He went on to complete his residency at the Baylor College of Medicine/Cullen Eye Institute in Houston, TX, serving as Chief Resident. Notably, he received the ASCRS Foundation Resident Excellence Award and the Steven N. Schindler, MD Award, recognizing the resident who most embodies high ethical humane standards. He is one of few specialists to complete a fellowship in Cornea, Cataract, External Disease, Refractive Surgery, and Glaucoma at the highly competitive Lindstrom Fellowship at Minnesota Eye Consultants. Dr. Parker is currently a member of the American Academy of Ophthalmology and the American Society of Cataract and Refractive Surgeons. He has participated in several research and educational projects as well as written several book chapters. Dr. Parker recognizes the importance of listening to each patient’s specific situation and post-operative goals. He strives to participate in local and international medical missions and to be able to teach in some capacity, as he enjoys helping others learn. Dr. Parker performs the most current cornea and anterior segment procedures available in the United States. These procedures include endothelial keratoplasties, penetrating keratoplasties, and deep anterior lamellar keratoplasties. Other procedures offered include cornea crosslinking, pterygium excision, premium and astigmatism-correcting IOLs, and complicated cataract surgeries, including dislocated lenses and post-refractive surgery cases. He also performs minimally invasive glaucoma surgery for appropriate candidates. Dr. Parker also performs a wide variety of refractive procedures including LASIK, PRK, limbal relaxing incisions, and refractive lens exchange. In his spare time, Dr. Parker enjoys spending time with his wife and son, playing pickup basketball, water sports, traveling, and trying new restaurants.